The basic Number Properties (or laws) that apply to arithmetic operations are Commutative Property, Associative Property, Identity Property and Distributive Property. 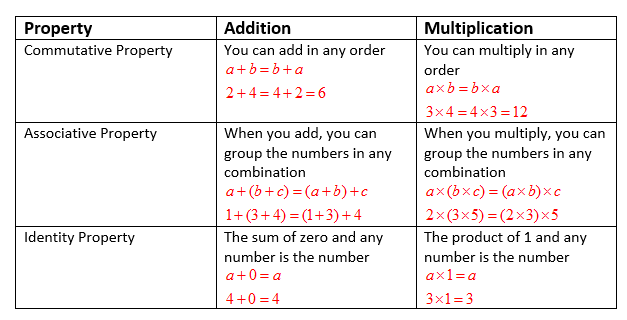 The following table gives the commutative property, associative property and identity property for addition and subtraction. Scroll down the page for more examples and solutions of the number properties. When you add 0 to any number, the sum is that number. For example: 325 + 0 = 325. When you multiply any number by 1, the product is that number. Identity Property of Addition: Any number plus zero is the original number. Identity Property of Multiplication: Any number times one is the original number. Zero is the identity number of addition and one is the identity number of multiplication. 2. Simplify each expression. Justify each step. Identity Property of addition states that any number plus zero is the original number. Identity property of multiplication states any number times one is the original number. This video defines the Identity Property. The Identity Property is made up of two parts: Additive Identity and Multiplicative Identity. Add zero (0) to a number, the sum is that number. Multiply a number by 1, the Product is that number. Divide a number by itself, the Quotient is 1. What is the identity property? How can you recognize it and name it when you see it? Why does it have the name it has? Why do mathematicians give everything, even something as seemingly simple as this a name?